Patrick’s second lecture on the concept of the physiological buzzer zone will take you deep into practical examples of how to apply this concept the real world of training. One of the most important and yet often overlooked areas of training is program management. The truth that many fitness professionals never talk about is that everyone is an individual and their differences must be taken account on a daily basis if performance is truly to be maximized. 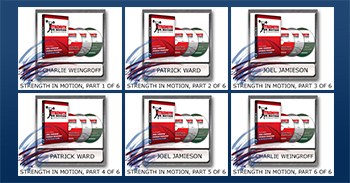 What is “corrective exercise” and how does it fit into the paradigm of physical preparation? In this lecture, Charlie shares his thoughts on what corrective exercise really is and what it isn’t and he demonstrates the best practices using real audience members to show how it should be done.